Day 12: Learning History Through Hymns and Carols–Plus A Free Songbook! 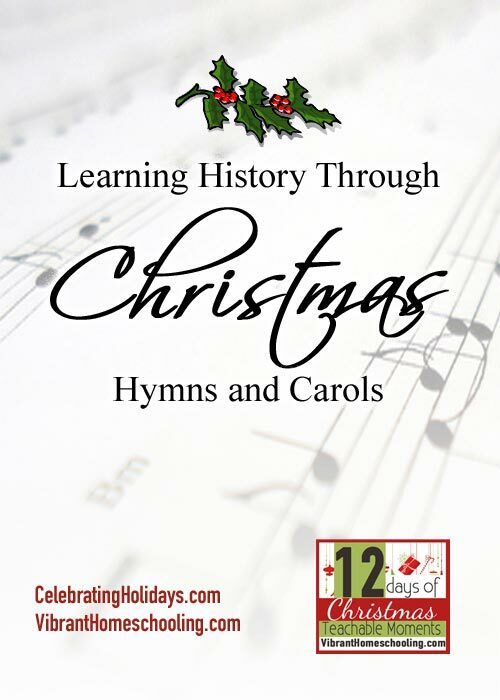 >> Day 12: Learning History Through Hymns and Carols–Plus A Free Songbook! This post is Day 12 of Vibrant Homeschooling’s “12 Days of Christmas Teachable Moments” series. As a homeschooling mom, I have come to believe that one of the most valuable gifts that I can give to my children is a language rich environment. Our family actively seeks out classic books, poetry, and music that are replete with beautiful prose. Recently, my family has begun a new tradition of learning one new hymn a week. Oh how this music has blessed us and exposed us to such an elegant use of language. Now that we have entered the Christmas season, we are eager to learn (and re-learn) beloved carols. While it delights us to learn and sing the words of Christmas carols, we find that we are equally blessed when we explore the history of these songs. For example, did you know that many of the words in the famous “Messiah,” composed by George Friderich Handel, are drawn from the prophecies about Christ in Isaiah? The words, “For unto us a child is born” (Isaiah 9:6) were written approximately 700 years before the birth of Jesus! Other carols are based on early church traditions, like “O Come, O Come, Emmanuel” which is drawn from the “O Antiphons” that were sung during the Octave (the eight days before Christmas). The word antiphon comes from a Greek word meaning “opposite voice” and generally refers to one group responding to another during a song or chant. The “O Antiphons” all began with “O” and highlighted titles of the Messiah as prophesied in the book of Isaiah — O Emmanuel, O Radix Jesse (Rod of Jesse), O Oriens (Radiant Dawn), etc. And did you know that a secret message was hidden in the “O Antiphons”? If you take the first Latin letter of each antiphon, ignoring the “O,” a phrase is revealed: “ERO CRAS.” In Latin, this means “I shall be [with you] tomorrow!” Isn’t that marvelous? We have also enjoyed learning the inspirational stories behind the lives of men like Isaac Watts (author of “Joy to the World”) and Charles Wesley (author of “Hark! the Herald Angels Sing”) who introduced original hymns and carols at a time in history (the 17th and 18th century) when Christians thought that it dishonored God to sing anything other than biblical psalms. One man complained that churches were singing Watts’ songs “as if the words of a poet were better than those of a prophet” (referring to the Psalms). Did you know that both Watts and Wesley wrote their hymns like poems (without any particular tune)? When these hymns were written, churches generally paired them with a handful of common tunes. It took over 100 years for “Joy to the World” to be paired with its current tune and for “Hark! the Herald Angels Sing” to be united with music by Felix Mendelssohn. Regardless, the authors and composers of many of our most cherished carols were doing what the Psalms themselves encouraged — singing to Him a new song, playing skillfully, and shouting for joy (Psalm 33:3). 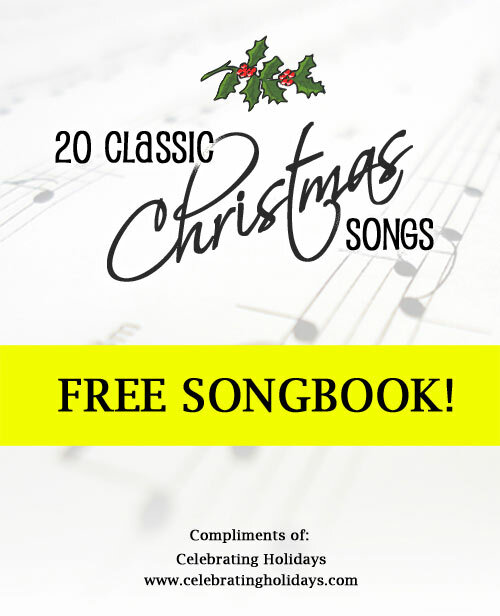 I am thrilled to offer you the words and music for 20 Classic Christmas Songs for FREE! I invite you to subscribe to my Celebrating Holidays blog for our “25 Days of Christmas Music” series. Beginning on Sunday, November 30 (the first day of Advent), I will be featuring a video each day with words and music for singing along. If you are interested in purchasing a resource for the history of Christmas songs (the stories are so inspiring), please visit the Celebrating Holidays eBooks page for our $2.99 eBook. Enter code “vibrant20” for a 20% discount. May your Christmas celebration be full of teachable moments!